The Powder Room is Finished – Uniquely Yours… or Mine! Even though I say it’s finished, I’m still thinking about my stenciling and maybe putting up some crown molding… so lets just called it finished for now ok? Pretty boring right? Everything was your basic builders grade and not really something I was digging. So I started with painting the room, I had a good amount of leftover paint from the Family room so I used it in here as well. The color is Smoke & Mirrors, it’s part of the Color Stories series by Benjamin Moore, it changes color significantly based on the light. The color is basically a gray but can shift for a brown gray to a purple gray, kind of cool right? I painted the vanity with “Smoke Signal” by American Paint Company, it’s a clay and chalk based paint. I just cleaned the vanity with Formula 409, then painted it with 2 coats of the paint… super easy… no priming necessary! After it dried I distressed and sealed the vanity with wax. I also filled in one of the holes on the doors and installed new glass knobs instead of pulls. 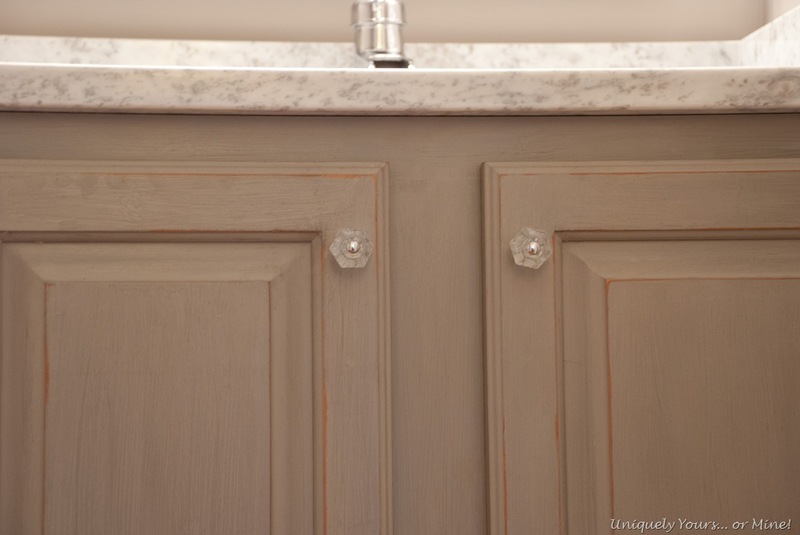 I’m the caulker around here so I caulked all of the seams on the marble and touched up the paint around the backsplashes. I LOVE everything about this new vanity & sink! 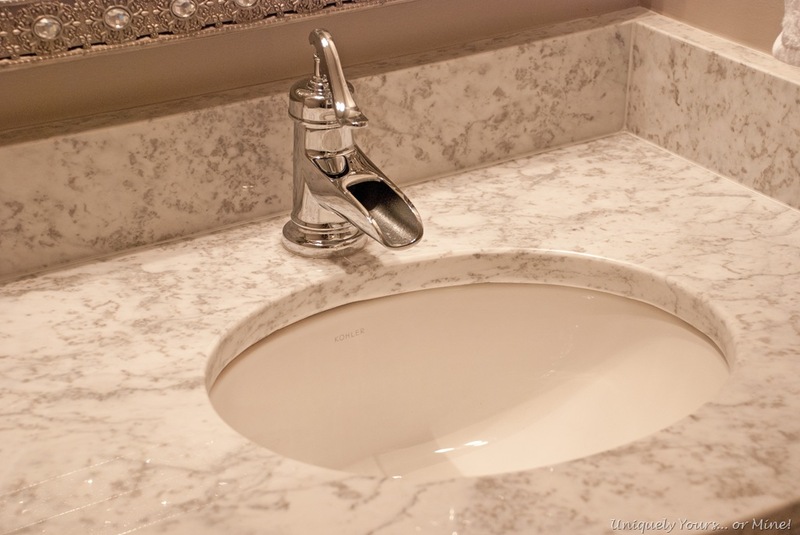 We chose to install a smaller sink than what was there previously so there was more marble visible… who needs a big sink in the powder room anyway? I’m enjoying the change and pretty happy to have checked this project off of the list! I am still working on the girls bathrooms and will be able to show you those updates soon! Gorgeous! Where did you get your light fixtures and towel holder? Thanks Mary! The towel holder was already here, it’s just a plain chrome fixture and the light I got from Shades of Light… Good vanity lights are so hard to find! So pretty!! 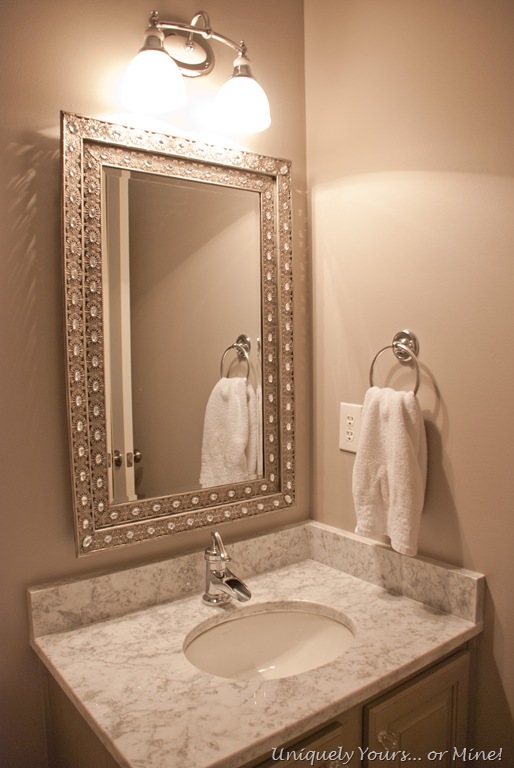 Love how you updated your vanity and sink! Thank you Martina! 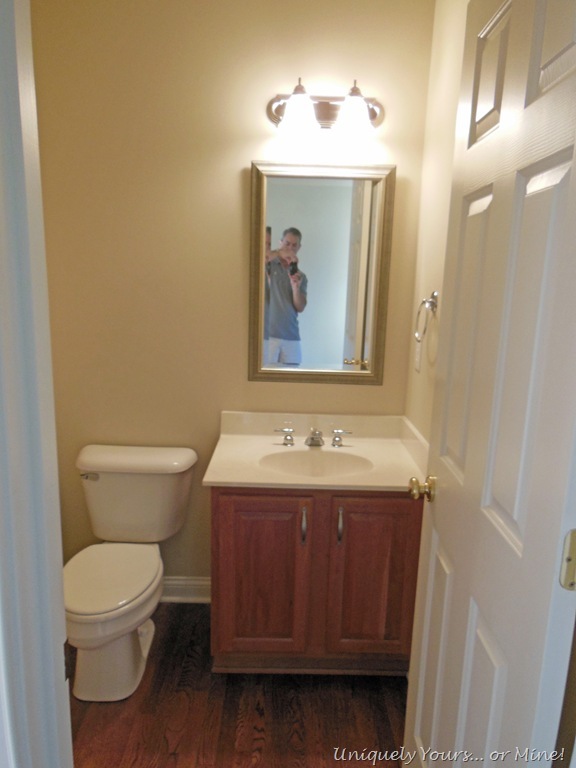 It was a pretty easy fix, I certainly didn’t want to have to remove the vanity and repair the floor! Looks great. Miss you, kid. Thanks so much Toni! I totally miss you too! Wow! What a change. It looks so pretty! Wow! What a difference! It looks so pretty! I love the color and I’m amazed you stenciled a whole wall. I would stop there. 🙂 It’s very nice though. Love the marble, fixtures, well everything! your bathroom is really lovely. I love reading about the wives doing the work, makes me get geared up to get something done. The bathroom looks gorgeous Susan. I love the stencil, I have been using Royal Design for years. The cabinet being painted made such a big difference. I like the wall as a focal point. Can’t wait to see what you decide. Sorry it took me so long, I am on email overload!!! Thanks so much Cynthia! That cabinet was so ugly I couldn’t have made it worse but I’m very happy with how it turned out! On the day you posted your powder room make over our new sink arrived for our small,tiny guest bathroom. We will start the make over next week. We have been collecting all the items I dreamed of. Lots of custom moldings. Paint, granite and the smallest glass vessel sink I could find. Our contractor will get the beadboard and start at end of this month. Just need lighting. I envy you being done but we are close. Great job I hope ours turns out as good. 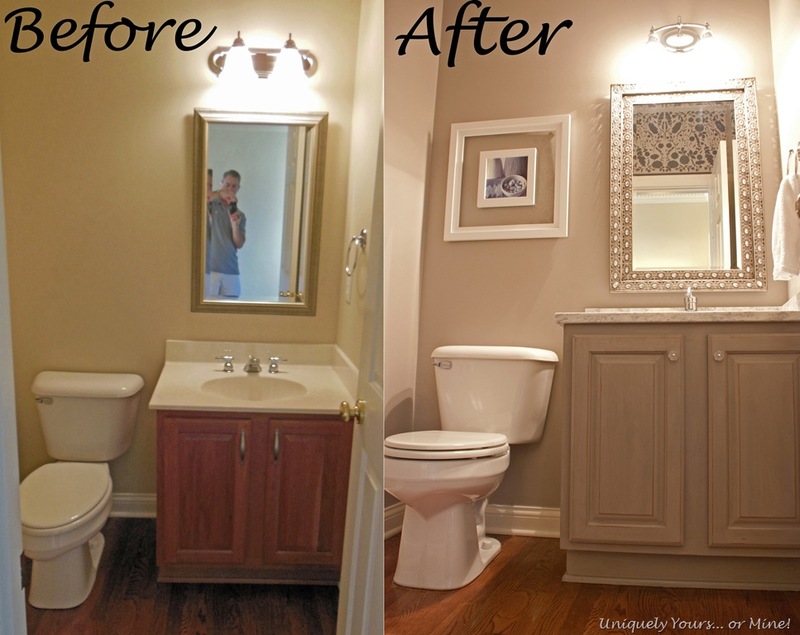 Oh, I love a good powder room makeover and yours sounds like it will be beautiful! Good luck finding lighting, I have a very difficult time finding good bathroom lighting (that doesn’t cost a fortune). Have fun with your makeover and thanks for checking out mine! Very lovely colors! You’ve done a beautiful job. I like the stencil, but would more be overwhelming in a powder room? Not seeing the entire room, it’s hard to tell. OTOH, my mom (2ce in Architectural Digest) was very big on large print wallpaper in bathrooms. Oh – no pun intended. Her rooms were always breathtaking. So this could be perfect!!! Thanks Christine! The powder room is not very big but I’m a huge believer in going bold in small rooms so I think it would look great on all of the walls, my issue is more of how much of a pain it would be to do the stenciling not so much how it would look… I so appreciate the feedback! Isn’t it always the way? I’m building (making the doors and drawers as we speak — taking a break!) floor to ceiling cabinets. Using a lot of gorgeous pallet wood and painting some for which I’d already made the doors. But it’s a HUGE project! Sometimes you gotta step back and think about it. And give yourself a moment to admire your work — and your progress! 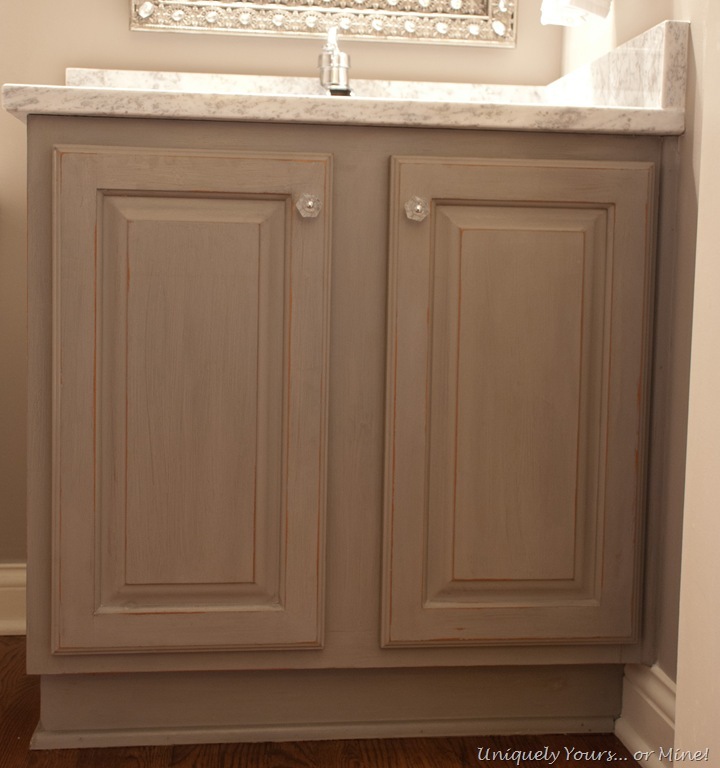 Love how your bathroom turned out – love the combination of colors and how your distressed the vanity! Susan, your little bathroom is so pretty! You really changed the look and that’s not easy to do in a tiny bathroom. 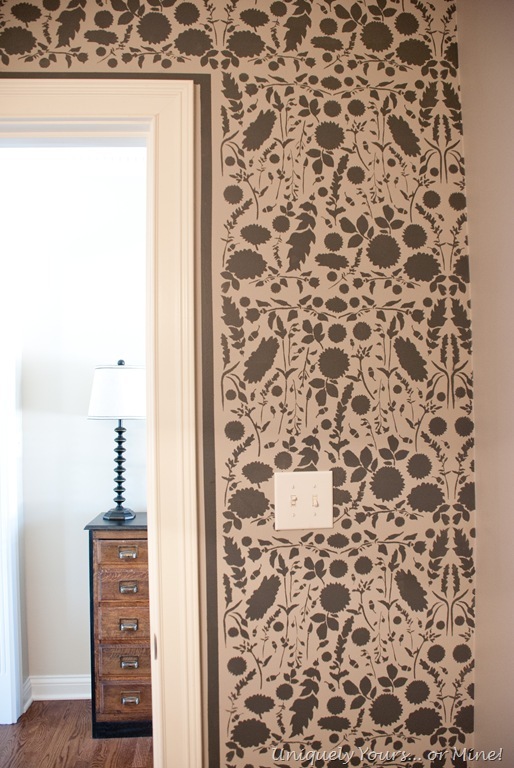 That stenciled wall is absolutely beautiful! Beautiful Job Susan!! I have never painted with chalk paint. What kind of wax do you use to finish the cabinet? Thanks Anna! I used CeCe Caldwell’s clear wax. It’s a great wax, easy to use and no smell. What a makeover girl! That is gorgeous! 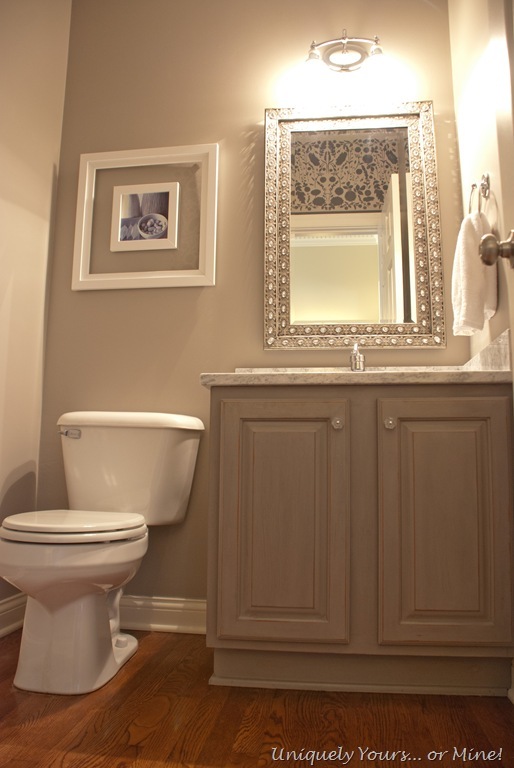 Featuring your powder room in this week’s PoPP Spotlight. Gorgeous! I love everything about it!! Your powder room looks lovely. Just curious, but did you paint the ceiling the same color as the walls? Thanks Robin! No I didn’t paint the ceiling, it’s just plain white, but it would look great painted if I had some crown molding up! I know your post was years ago, but would you happen to know where you got the beauuutiful mirror? Bathroom looks absolutely beautiful! 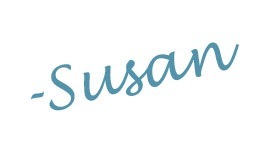 Thanks so much Sue! I do happen to know… it was Pier 1! Hope that helps! !